Size: 44 1/2" x 47 3/4"
Another baby on the way and another excuse to make a quilt. I purchased the fabrics for the front at the Stitchin' Post in Sisters, Oregon in the fall. While Morgan was here for Thanksgiving I showed her the fabrics to see if she was okay with the colors before I got going with the quilt. She loved them, so I was all set. Once I had the front pieced I located a great backing flannel at Cool Cottons in Portland. 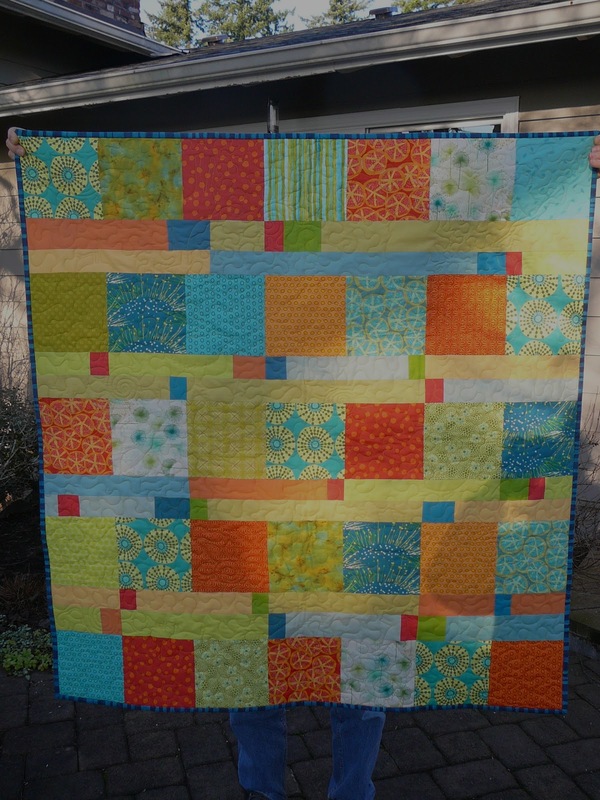 The quilt was patterned after a quilt I saw from "Film in the Fridge" (Blocks & Stripes). For the quilting I did a meandering path with 30 images inserted here and there. pig and spider - When I was quilting I ended up with a small area next to the pig. I made a label for the back - thanks to some google research and HP instructions. I used fabric ironed to freezer paper, ran it through my inkjet printer, heat set it with an iron and voila! It worked great. Not only was it cheaper, but I could choose the exact fabric I wanted to use. and the Marcia Derse fabric for the binding. I am still in the process of learning how to take better photos of my work. The hardest part for me is getting the color to be true. Here is one more shot of the quilt that I think gives the best record of the colors. This was so fun to make and went together very quickly. I love how this pattern shows off all of the fun fabrics.